The Ulysses network federates European partners involved in the support and promotion of young artists. 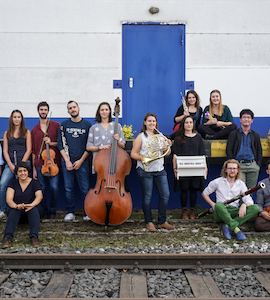 These partners (academies, summer schools, support programs connected with ensembles or festivals) play a fundamental role in the recognizing, accompanying, professionalizing, and development of the carriers of young European composers and performers, some of them for longer than 20 years already. The network has chosen the name Ulysses, European figure of an emblematic and symbolic journey, personified in human and artistic adventures. The network is supported by about fifty associated partners (ensembles, festivals, diffusion locations), vector of an extensive and visible diffusion of the projects carried out. IRCAM is the coordinator of the network. The Institute for Research and Coordination Acoustic/Music. It is one of the world’s largest public research centers dedicated to both musical expression and scientific research. IRCAM is a unique location where artistic sensibilities collide with scientific and technological innovation. Frank Madlener has directed the institute since 2006. IRCAM’s three principal activities – creation, research, transmission – are manifest in IRCAM’s Parisian concert season, in the institute’s annual festival, and in productions throughout France and abroad. IRCAM is a major center of musical creation as well as being a production location and a unique residence for international composers. 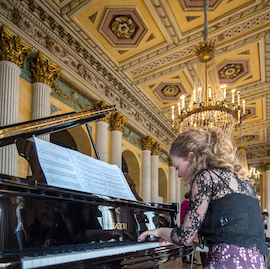 The institute’s season is full of unique encounters with composers and artists from the contemporary stage and it supports contemporary composition with a commission policy. Numerous artist-in-residence programs result in the creation of multi-disciplinary projects (music, dance, video, theater and film). Finally, the institute’s annual festival, AGORA, makes contemporary music creation available to the public. World renowned as an outstanding year-round performance centre, Snape Maltings is also a place where artists at all stages of their career can be inspired and energized. With inspirational scenery, a rich musical heritage and the time and space for musicians and audience to discover, create and explore, Snape Maltings is the place to help artists reach full potential and define their own musical landscape. The Divertimento Ensemble was founded in 1977 by several of the most important musicians in Milan, in collaboration with many other internationally renowned instrumentalists. With Sandro Gorli as director, the Ensemble quickly attained considerable success both in Italy and abroad, with over 1000 concerts and 10 CDs to its credit to date. In 1978, only its second year in existence, the Ensemble was included in the prestigious programmes of Milans Societa de Quartetto and the Musica nel Nostro Tempo music festival. Over seventy composers have dedicated new compositions to the Divertimento Ensemble. These works, and many others, have helped consolidate one of the worlds most inclusive and up-to-date repertoires of new music, both Italian and international. The Ensemble has held concerts in France, Spain, Switzerland, Germany, Austrian, Belgium, the Netherlands, United Kingdom, Yugoslavia, Poland, Mexico, Argentina, United States, Japan and Russia, as well as the most important cities of Italy. The Ensemble has taken part in the most important contemporary music festivals in Europe, and has been invited to participate in the Venice Biennale nine times between 1979 and 2007. For a number of years, in addition to its concert performances, the Ensemble has been strongly committed to the promotion musical education, taking and active part in the orchestra conducting courses, held actually by Maestro Gorli. This program is dedicated specifically to music from the early 20th century up to the present day. Estonian Philharmonic Chamber Choir (EPCC) is one of the Estonia’s best-known professional music groups in Estonia. The choir was founded in 1981 by Tõnu Kaljuste, the choir´s artistic director for 20 years. 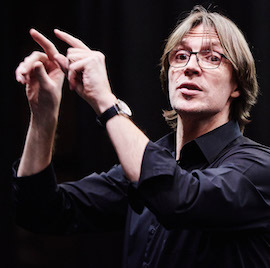 In 2001–2007 English musician Paul Hillier took over; between 2008–2013 the chief conductor was Daniel Reuss and since September 2014 the choir is working under Kaspars Putniņš. The choir’s repertoire ranges from Gregorian Chant to the 21st century music, with the main focus on Estonian music (Veljo Tormis, Arvo Pärt etc). The choir gives 60–70 concerts per season and has been a welcomed guest at many famous venues all over the world, including Royal Albert Hall, Sydney Opera House, Wiener Konzerthaus, Carnegie Hall, Walt Disney Concert Hall etc. EPCC recordings (labels ECM, Virgin Classics, Carus, Harmonia Mundi) have won several prizes including two Grammy Awards for Arvo Pärt’s Da Pacem with the conductor Paul Hillier (2007) and Arvo Pärt’s Adam’s Lament with the conductor Tõnu Kaljuste (2014). Flagey was born of a bold joint initiative by representatives of the country’s three communities with the aim of creating a quality cultural institution that is European in scope. The Flagey ponds are surrounded by grand townhouses, the building is also part of a lively working-class area. Our aim is to include everyone in our programming, and make the success of Flagey a bonus for the whole neighbourhood. The Gaudeamus Muziekweek, held annually at the beginning of September in Utrecht, presents the work of young music pioneers. From classical crossover and minimal soundscapes to modern composition with (live) electronics, each year new works are presented in exciting programming formats at extraordinary locations. An important part of the Gaudeamus Muziekweek is the Gaudeamus Award, an incentive prize for composers younger than 30. Prior to the festival itself, the Gaudeamus Muziekweek Academy takes place, offering several public workshops for young composers, as well as a glimpse behind-the-scenes at rehearsals of the shortlisted works. The Gaudeamus Muziekweek is THE international meeting place for young composers from all over the world. Founded by Beat Furrer and Ernst Kovacic impuls, the International Ensemble and Composers Academy for Contemporary Music and Association for the Communication of Contemporary Music has developed into one of the internationally leading institutions in this field within shortly. Instrumental classes and ensemble work, composition classes and special programs such as Ensemble meets Composers’Pool, electronic-and improvisation-workshops… : Every second year the impuls Academy offers young musicians and composers – from Austria, but also from over the world – an intense training and holistic approach to contemporary music, both in a theoretical and practical way. For about 14 days impuls hereby builds an important platform for joint working, mutual learning and international exchange in Graz, Styria. An international team of renowned musicians and composers as lecturers guarantees highest quality and builds the basis for excellently educated, highly motivated and internationally interlinked young musicians and composers as competent and authentic messengers of music as a language without borders. In addition to the impuls Academy the impuls Festival with public concerts, presentations, lectures and various music communication programs, impuls MinuteConcerts in galleries and public workshops (also for kids)… offer various possibilities – also to a broader audience with open ears – to experience new and contemporary music and turn Graz into a center of contemporary music and festival -city for two weeks in Ferbruary. Vibrant learning, experimentation and discourse. It was with this objectives in mind that the International Ensemble Modern Academy was founded in 2003 as the logical extension of everything the Ensemble Modern (EM) stands for: the highest quality, the joy of performing, interdisciplinary art projects and internationality. Over the last thirty years the EM has discussed and analysed many artists and their works and has gained a deep understanding and extensive knowledge of music from the beginnings of the 20th century onwards: a »memory of modern music«. The IEMA, whose activities are mainly operated by the members of Ensemble Modern, strives to give young artists the opportunity to share in this memory and derive manifold benefits from it in various ways. Presenter and network, center for documentation and information, operational center and initiator for new music since 1946 – the International Music Institute Darmstadt (IMD) is all of these things. With its International Summer Courses for New Music, its Archive, and its Library the IMD continues to make and document cultural history as a constant interplay of invention, performance, listening, reflection, and retention. The International Summer Academy of Contemporary Music, taking place at the Hochschule für Musik und Theater (HfMT), Hamburg (DE), is an open space for young qualified postgraduate students, where they can immerse themselves intensively in contemporary chamber- and ensemble music. At the Academy, a varying group of postgraduate composers, instrumentalists and conductors get together with an experienced «ensemble for New Music» and various tutors for an intensive work experience. In daily workshops, the musicians rehearse new pieces and commissions together with the members of the ensemble in residence and the tutors. Biennially, a distinguished «composer in residence» will be present, who also works with the young composers and instrumentalists and instructs them in the preparation of his/her own piece. The participating composers explore how to perform and conduct their own pieces with the instrumentalists and the «ensemble in residence». The practical workshops are complemented by lectures of the invited composers and by career training. The Summer Academy provides an opportunity for international instrumentalists and composers to experience contemporary music in a truly personal and inspiring atmosphere that facilitates experimentation and the encounter with different aesthetics. At the end of the Summer Academy, the workshop results are presented in a final concert. Royaumont is a unique centre devoted to residencies and support for artists. In 1936, Henry and Isabel Goüin had the visionary idea of using the Abbey and its buildings as a “residence for performers and intellectuals” and the refectory with its Cavaillé-Coll organ as the venue for the first Music Season. After the Second World War, they turned the Abbey into an international cultural centre, an alternative to university institutions and in 1964, it became the first French cultural foundation with public interest status; since then the Foundation has continuously expanded its horizons. Royaumont is a unique venue where public performances, reflect the centre’s activities: research on musicology and practice, rehearsal of new works and training workshops. It focuses on the long-term creative process and supports artists in residence as they develop. With its rich musical library, its organ and its fitted-out work spaces, Royaumont is an outstanding centre offering artists in residence an opportunity to experiment, create new works and transmit their achievements at the Abbey and outside its walls. The centre is focused on five arts programmes: voice and its on-stage performance, keyboards (organ, harpsichord, pianoforte and piano), contemporary music, transcultural music and choreographic research and composition. Royaumont’s secluded setting and residential facilities offer artists a unique place to study and experiment undisturbed. Time of Music (Musiikin aika) festival is the only annually organized contemporary music festival in Finland. The festival takes place in Viitasaari, Central Finland, where it was founded in 1982. The festival consists of concerts, courses, master classes, seminars and other presentations. Time of Music has hosted the most important composers and artists of the field during the past years, gaining an international reputation as a courageous, border-breaking, and innovative event. Names like Aperghis, Cage, Crumb, Ferneyhough, Ligeti, Saariaho, Stroppa, and Xenakis have visited the festival among many others. 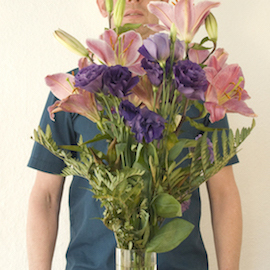 Currently the artistic director is composer Johan Tallgren. Finland Festivals chose Time of Music as the Festival of the year 2009. The Ultima Oslo Contemporary Music Festival is Scandinavia’s largest contemporary music festival, and since 1991 it has been a key arena for contemporary music and related art forms in the Nordic region. The festival is organised as a foundation comprising seventeen of the most influential art institutions and organisations in Norway. 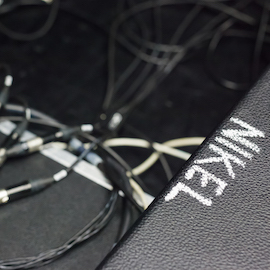 sound installations, multimedia productions, music-theatre and performance. The entire city serves as the arena for the festival, from The Norwegian Opera & Ballet to small clubs. Ultima is also arranging “The Ultima Academy”, an international symposium for the dissemination and discourse of contemporary music. The festival is supported by the Norwegian Arts Council and Oslo City Council. His Royal Highness Crown Prince Haakon is the patron of Ultima. The ULYSSES network works with a second circle of international professionals, that contributes to promote and disseminate the actions developed through the network. SACEM is a private entity; it is a non-trading company [“société civile”] directed by authors, composers and publishers. The Board of Directors is elected every year by the Annual General Meeting and is comprised of six authors, six composers, one author/film director and six music publishers. The Executive Board administers Sacem; the CEO of the Executive Board is appointed by the Board of Directors and manages SACEM. to collect payments of authors’ rights and redistribute them to the original authors and composers and the publishers. >to help young authors, composers and performing artists be trained to professional standards. Social initiatives helping members who are elderly or are experiencing difficulties, via mutual aid payments. Professional initiatives to promote original work and help the music sector operate more efficiently. Since its establishment in 2000 the Allianz Cultural Foundation supports transnational artistic and educational projects that breathe the spirit of international cooperation. Young artistic talents from all over Europe and the neighbouring countries of the Mediterranean Sea are its target group and, at the same time, the protagonists of its programs. Together with them the Allianz Cultural Foundation develops projects that permanently promote mutual understanding and awareness. With such initiatives the Foundation seeks to contribute to creating a civil society based on common motives and values. Associated to the Royaumont foundation, the Honegger Foundation accompanies and supports the creation of new young artists works. In the field of music the Foundation supports institutions and projects which promote the understanding of new music. It is in addition involved in the preservation and improvement of access to and new discovery of works of all eras and for the imparting of new technical and interpretive knowledge. Along with commissioned works, concerts and events are also supported, as well as educationally valuable projects that give children and adolescents access to contemporary music. Competitions, academies and workshops where music students and young composers, conductors and instrumentalists can demonstrate their skills, individual academic publications and complete editions also sponsored. Within the Finnish Government, the Ministry of Education and Culture is responsible for developing educational, science, cultural, sport and youth policies and international cooperation in these fields. The Minister of Education and Science, Mr. Jukka Gustafsson is responsible for education and science policies and the Minister of Culture and Sport, Mr. Paavo Arhinmäki for cultural, sport and youth policies. The Finnish Music Foundation (MES) was founded in 2012 for promoting and supporting Finnish music, both performing and creative. The Caisse des dépôts supports actions that help to popularise the contemporary art music, and particularly the Contemporary music events and actions at the Royaumont Foundation.